After 3 fantastic days in Jaipur, I had to abandon the world of luxuries and start a real road-trip around Rajasthan. 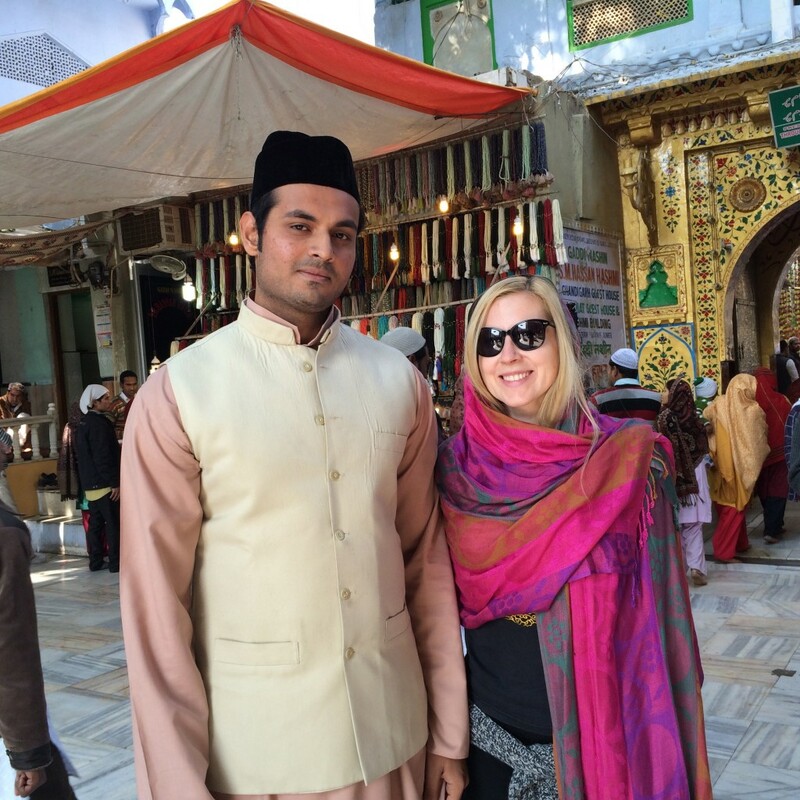 On January 7, I planned to pay a visit to two most important religious sites in Rajasthan – Ajmer and its Dargah of the Sufi’s saint Khwaja Muin-ud-din Chishti and an ancient Hindu pilgrimage town of Pushkar. It is a very common itinerary since Pushkar is a huge touristic hub for both, hippies and spirituality seekers. Sadly, Ajmer always stays in a shadow, however, it was my favorite place out of two. Ajmer, the Rajasthan’s most important site in terms of Islamic history and heritage, was founded in late 7th century A.D. by Ajayraj Singh Chauhan, a clan branched out of Chechi Gurjars. For many centuries Ajmer withstood the repeated invasions by Turkic Muslims of Central Asia, until in 1193 it fell to Muhammad of Ghor, founder of Delhi Sultanate. Heavy tribute payments to Delhi guaranteed Ajmer a relative autonomy until 1365, when the city was captured by the ruler of Mewar. Since 1509, control of Ajmer was disputed between the Maharajas of Mewar and Marwar, until the city was conquered by the Mughal Emperor Akbar the Great in 1559. In the 18th century, reign passed to the Marathas and from 1818 till 1956, the area was directly administered by the British Raj. It took Sunil and I about 2 hours to drive 135 kms from Jaipur to Ajmer, and at 11 am I was already standing by the Soniji Ki Nasiyan (or Siddhkoot Chaityalaya). Also know as The Golden or Red Temple, this architecturally rich Digambara Jain Temple was built in 1865 by Soni family. The complex consists of two structures – the main temple building and a two storied Svarna Nagri Hall located behind the temple and known as the Museum. Greatly revered by the Digambar sect of Jains, the Nasiyan temple is dedicated to Lord Rishabhdev, first of the 24 Tirthankars (religious path-makers of the Jains). The beautifully carved entrance gate of the temple is made of red sand stone brought from Karauli. The temple’s court houses an artistically designed 25 m high Manastambha and a marble staircase, leading to the main temple, which is embellished with images of the Tirthankars. The halls of the temple are said to be adorned with series of large, gilt wooden figures and delicate paintings that display scenes from Jain scriptures. The central image is of Lord Rishabhdev seated in the “Samavasarana“, in which he imparts true knowledge to the humanity, so that they get liberated from the entanglements of life and death. Unfortunately, this part of the temple is closed for non-Jains, or as the guard told me “It is the Soni’s family property and at their discretion no foreigners are allowed”. Since I couldn’t bribe my way into Siddhkoot Chaityalaya, I went to check out the Svarna Nagri (admission Rs.10, shoes storage is free). It is sort of a museum that hosts only one item – a three- dimensional replica of the story of Rishabhdev in accordance with an old manuscript by Acharya Jinasena. The thought to have such an impressive model occurred to Seth Moolchand Soni after completion of the main temple in 1870. He wanted to build a figurative representation of the five auspicious events (panch-kalyanak) in the life of every Tirthankara: conception, birth, renunciation, enlightenment, and salvation (moksha or nirvana). It took Jaipur masters 25 years to complete this work and now, it is considered to be the largest (24.3 m by 12.2 m) and most artistically represented mythological narrative. You can’t really approach the structure, but you can see it from different directions and levels by following the corridor encircling the model. 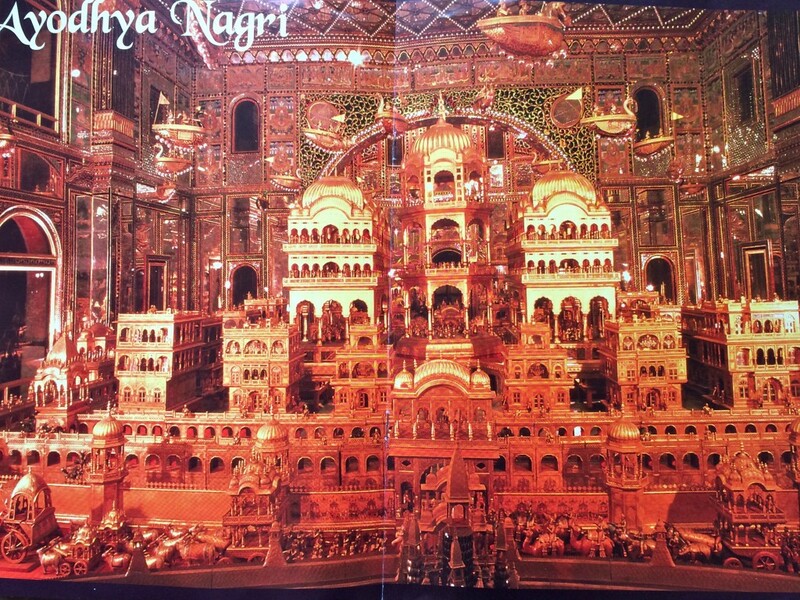 I was very impressed by the grandeur and amount of details depicted in Svarna Nagri. After admiring the Nasiyan Temple for about an hour, Sunil drove me to Dargah Sharif, so that I can participate in pilgrimage to the Muslim’s holy of holies in India. It is impossible to approach the Dargah by car since Dargah Bazaar is one of the busiest shopping streets in Ajmer. Sunil dropped me off about 1 km away from the main gate; aware of “No bags, no cameras” policy at the Dargah, I took my wallet, my iPhone (which was allowed) and entered the Bazaar. I had mixed feelings while walking a road leading to Dargah. Even though it didn’t look any different from other crowded places I have visited in India, I knew that this road would take me to a special place. I guess it was the presence of chadors and flower vendors as well as a dense flow of people on a mission. The spiritual aspect of the experience died out when I looked under my feet and saw beggars, ton and ton of them in different state of physical mutilation (whether accidental, by birth or purposely inflicted, I can’t judge). The closer I got to the Islamic Shrine, the more it resembled la cour des miracles! 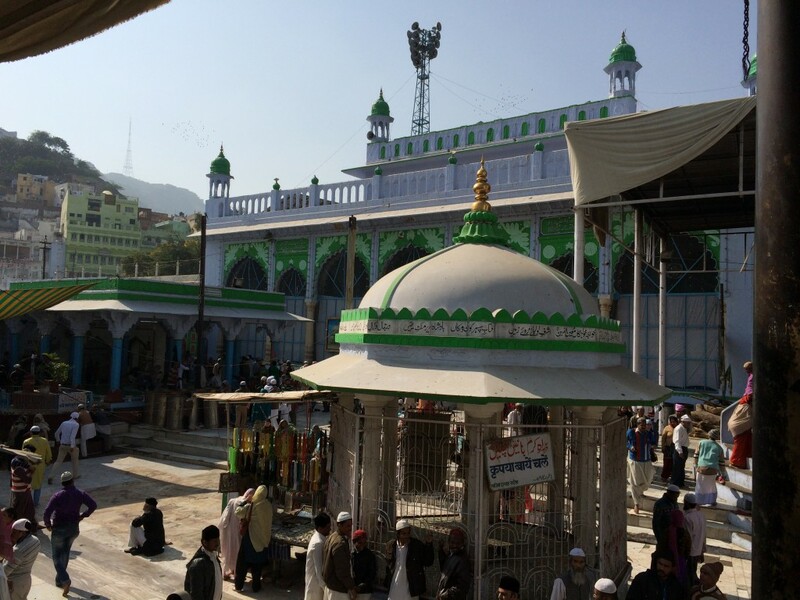 The Dargah Sharif or Dargah of Khwaja Muin-ud-din Chishti is a holy place because it hosts the tomb of a Sufi saint and a founder of a Chishti Order on the Indian subcontinent, Khwaja Muin-ud-din Chishti, who came to Ajmer from Persia in 1192 and died here in 1236. Khwaja Muin-ud-din was born in 1141 in Chishti in Sistan region of Eastern Persia. His parents died when he was 16 y.o., but they left him a windmill and an orchard to take care of. Legend has it that once, when he was watering his plants, a revered Sufi Shaikh Ibrahim Kunduzi came to his orchard. Young Khwaja offered him some fruits from his garden and in return the Sufi gave him a piece of bread. Upon eating the bread, Khwaja became enlightened; he distributed his property and money and left for Bukhara in search of knowledge and education. After acquiring education, Khwaja travelled widely in search of a pir (spiritual guide). He met Nazrat Khwaja Usman Haruni, who was at the time the greatest scholar and spiritual leader, and after the very first meeting, he completely submitted himself to Usman. For 20 years Khwaja was a devoted follower of Usman Haruni and after passing various stages of a spiritual life, he was honored by his teacher to accompany him to Hajj to Mecca and later to Medina. It was in Medina, where Khwaja received an order from The Prophet requesting him “to proceed to India and show the path of truth to the people there”. Khwaja arrived to Ajmer in 1190 at the age of 52. When the news spread that a pious Devrish inhabited a hill by Ana Sagar lake, many people flocked to him for treatments and blessings, including Sultan Muhammad Ghori. In Ajmer, Khwaja Chishti attracted a substantial following and acquired a great deal of respect from the residents, introducing Islam to masses. Neither Khwaja Chishti nor his immediate disciples ever wrote down his teachings, but it is accepted that his Sufi Sulh-e-Kul (peace to all) concepts laid the foundation of the Chishti order in India. He preached renunciation of material goods, strict regime of self-discipline, independence of rulers and the state, generosity to others and tolerance and respect for religious differences. Khwaja Chishti urged his disciples “to develop river-like generosity, sun-like affection and earth-like hospitality”. Khwaja Muin-ud-sin Chishti died on March 16, 1236 at the age of 97 and was buried in the same cell where he preached his teachings at the foot of the Taragarh Hill. However, his story wasn’t over. He left after himself a few prominent successors, including Hazrat Shaikh Nizamouddin Auliya, who ventured to different parts of the country, serving the people and preaching the tenets of Islam. However, It was during the reign of Akbar the Great (1556-1605) that Ajmer emerged as one of the most important religious centers in India. Construction of the shrine was completed by Humayun, but many other parts of Dargah were commissioned and added by other Mughal emperors – Jahangir, Shah Jahan, Aurangzeb and so on. Akbar and his queen used to come here by foot on pilgrimage from Agra (370 kms away) every year in observance of a vow (he asked to be blessed with a son, since he had no male heir). The large pillars – Kos Minars – were erected at intervals of 3 kms along the entire route between Agra and Ajmer to mark the places where the royal pilgrims halted every day. Akbar also presented the Dargah Sharif with a big cauldron (deg) sufficient to cook for 5,000 people and two large drums. They say that over 125,000 pilgrims visit the site every day and I was about to become one, along with Akbar the Great. 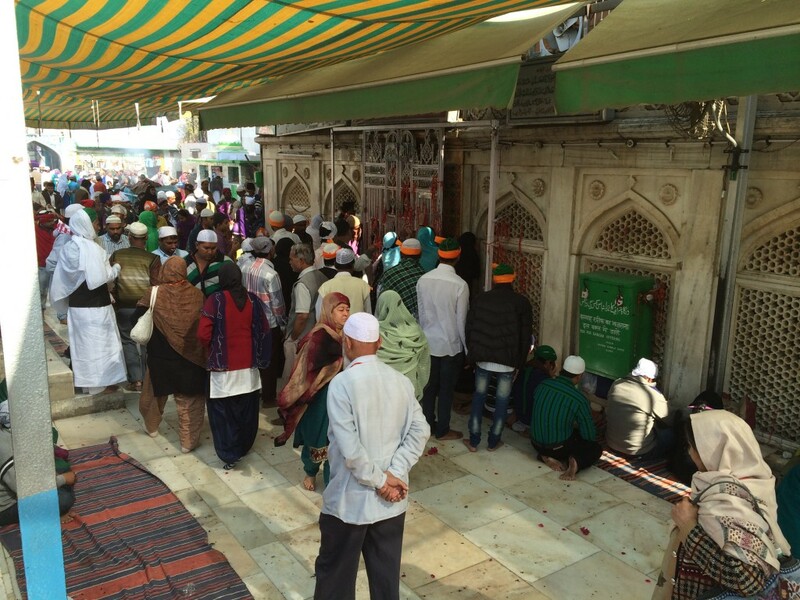 The crowds, beggars and vendors almost distracted me from the purpose I came to Dargah Sharif. I stood in front of the stunning Nizam Gate (given as a present by Nizam of Hyderabad), gathering my thoughts and admiring the beauty of Arabic writings on the walls of the gate. I knew that I had to bring something with me as a donation, but I didn’t know what and Zeeshan came to my rescue. He is one of the volunteers assisting the visitors at Dargah. Not only did he suggest to buy flowers and chador (Rs.700) as a donation, but also he took me into the shrine and around the premises, explaining things and sharing bits of history I didn’t know. It didn’t hurt that he was a very good-looking and composed young man, who escorted me through the Sharif Dargah with such feel of importance as if I were a Russian Tsaritsa Sviatlana. Dargah Sharif consists of several courtyards and we passed via three gates (Nizam, Nakkarkhana (drums gate) and Buland Darwaza) in order to reach the central courtyard where the saint’s domed tomb is located on the silver platform. Pilgrims from all walks of life and faith, irrespective of their caste, beliefs and creed come here hoping that the saint’s spirit will intercede on their behalf. They leave notes and holy strings attached to the railings, expecting the miracles to happen or thanking for something that already occurred. The amount of people “storming” the shrine was unimaginable; shouting to hold tight to my wallet and camera, Zeeshan dragged me to the center of the shrine. He speedily entered the sacred space behind the railings where the actual tomb was located, placed my offerings on the tomb and called me to come close so he could bless me. I did all as he said, even though it was almost impossible to squeeze through the ocean of people, but when i did, I was relieved to accomplished something I’ve planned. Sadly, neither the atmosphere nor the people’s attitudes inspired me to stop for a moment and reminisce or think or reflect on something important to me. After visiting the main shrine, Zeeshah walked me through the Dargah, showing the degs (large iron cauldrons) donated by Akbar in 1567 and his son Jahangir in 1631, green and white Akbari Masjid, which currently serves as an Arabic and Persian school of religious education, and also the courtyards. People visiting Dargah were curious but very friendly, none of them pulled out his/her camera or phone to snap a picture of me, nobody asked me where I was from and why iIcame there – we all came to Dargah for a reason and they respected my privacy. After making a small (Rs.500) donation to Dargah Sharif, I was peacefully escorted back to the Nizam Gate, where I thanked Zeeshan for his help and promised to stay in touch. 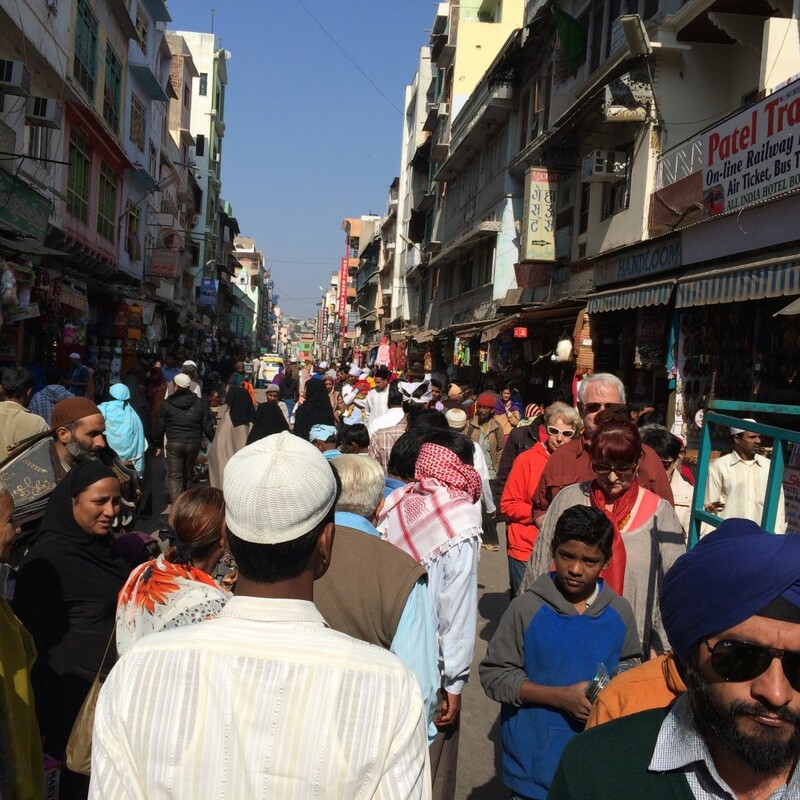 Walk back to the car took even longer because the Dargah bazaar became impassable due to even denser crowd. 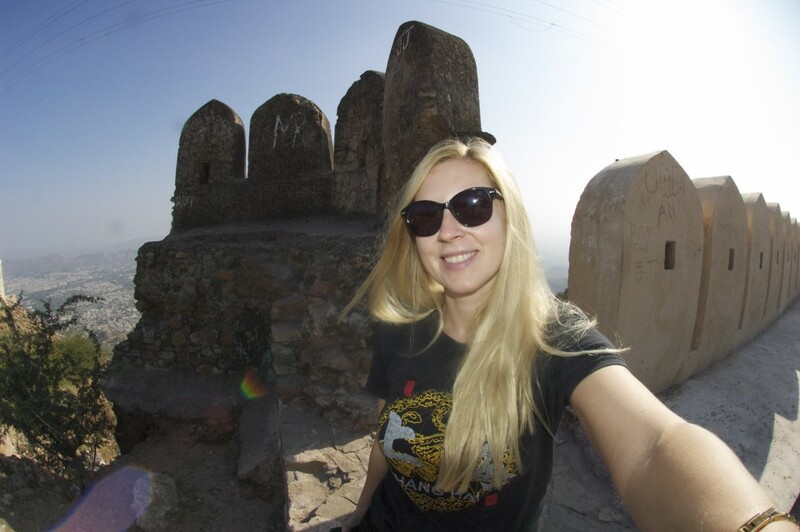 After getting into a car, Sunil was ready to proceed to Pushkar for a night, but I had another important place to visit, a place that even my driver, with his 10 years of experience in Rajasthan, has never been to – Taragarh Fort located on a steep hill south of Dargah Sharif. Ajameru Doorg, as it was originally know, was built by Raja Ajaypal Chauhan, who was also a ruler of Sapadlaksh territory, in early 6th century A.D. It is reputed to be one of the oldest hill forts in India and the world, though not much remains since its glorious past. The fort unique defense and strength lied in impregnable ruggedness and acclivity of the mountains on top of which it was built. It has seen many battles and nerve-wrecking sieges and was considered to be invincible, however that proved to be wrong. Since the 6th century it changed hands from Rajpur to Muslim to Maratha to Brits. I wanted to see the oldest fort in India and all i’ve got was a 5 meter long stretch of an old wall along with a 3 kms of newly constructed walls. Indeed, there were very few things left from the Fort’s past, however, I realized that it is another huge pilgrimage site for Muslims, coming from all over India to visit Hazrat Meeran Sayd Hussein Dargah. During the the reign of Qutb-ud-din Ebak, Hazrat Syed Meeran Hussain was the Garrison Commander of Taragarh Fort. While playing polo in Lahore, Sultan Qutb-ud-din Ebak fell down from the horse and died. As soon as the news of his death reached Ajmer, the Thakur and Rajput landlords of adjoining areas collaboratively launched a night attack on Taragarh Fort by entering the fort and murdering everyone on their way. Hazrat Meeran Hussain was also martyred in the attack. When the people of the city woke up in the morning and saw the bloodshed, they began a mass mourning. Hearing about the tragedy, Khwaja Moin-ud-din Chishti visited the fort with his followers and after performing the Namaz-e-Janaza, he buried the martyrs of Taragarh Fort. Indeed, people don’t come to Taragarh to look at the ancient fort, but to pay their tributes to the Dargah Sharif of Hazrat Meeran Hussain. Before following the crowds without realizing where they road would take me, I looked around, still in desperate search for the old walls of the fort. I circled the ruins around the road, visited a half-finished, but already beautiful mosque outside the gate and witnessed a man taking a bath in the garbage, literally. While climbing the stairs to the old town, a hijda approached me. S/he gently pinched me on my cheek saying that I was pretty and with a roaring laughter ran down the stairs. I have heard and read about hijdas, but it was my first face-to-face encounter. I guess I was lucky! I took my shoes off and entered the Dargah Sharif of Hazrat Meeran Hussain via a massive white gate. 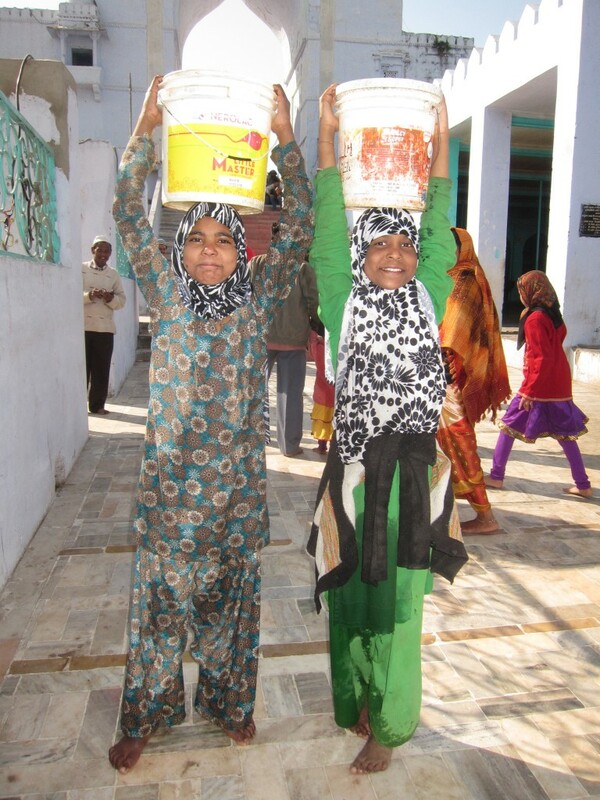 Two Muslim girls 8-10 years of age with heavy buckets of water on their heads led me all the way to the shrine. On the way back, when I was looking for my shoes, one of them rushed to me carrying them; apparently, she was worried that somebody might take them, so they kept it safe for me while I was at the Dargah. The old Taragarh fort felt surrealistic as if it froze in time – the streets, the people with their odd clothes and manners; nevertheless, everyone seemed peaceful and welcoming to me. After walking around the green-and-white courtyards of Taragarh Dargah and chatting with a lot of friendly and curious people, I left the shrine and went to explore the old city. Right outside the side gates, there were two huge 1,600 and 3,200 kgs degs in use to serve food for poor people. While taking pictures of the degs, a crowd of girls surrounded me and asked to take pictures of them. I spent 10 minutes snapping photos of everyone and they all seemed to be super delighted not only by the process but by the results as well. The photo session brought a sort of commotion to the sleepy streets of this town from Middle Ages, so I tried to slowly and respectfully withdraw from the gate area into the back streets. It was a wonderful walk, full of character and calmness – no Westerner stepped a foot on those streets for a long time. I found a true gem destination next door to a touristic Ajmer. There are more things to see in Ajmer, including a famous Qutb-ud-din Jhonpra, Magazine (Price Salim’s former house), Mayo College and Ana Sagar lake. 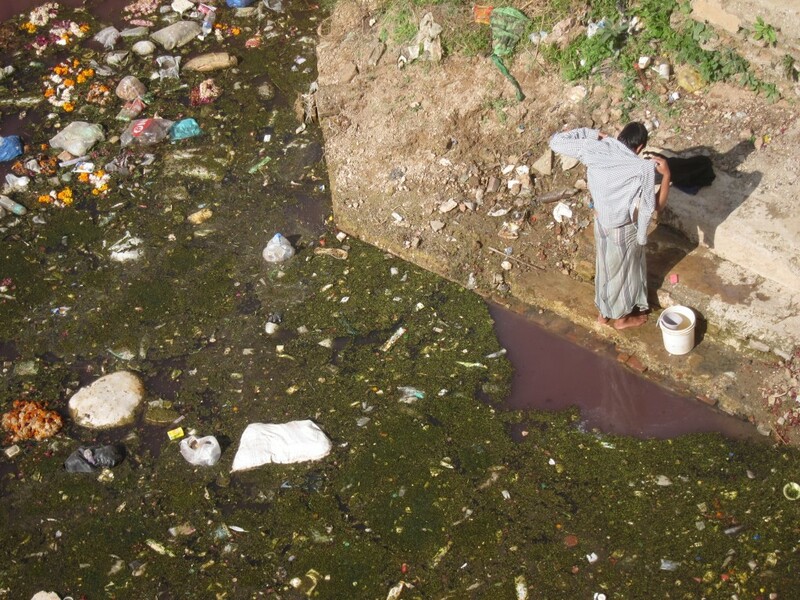 Sunil never got to understand why I was so fascinated with Muslim culture willing to spend hours browsing the Dargahs. Tonight, all he wanted was to take off to Pushkar and call it a night as soon as possible. Just 11 kms away from Ajmer, Pushkar has its own charisma and interesting history. 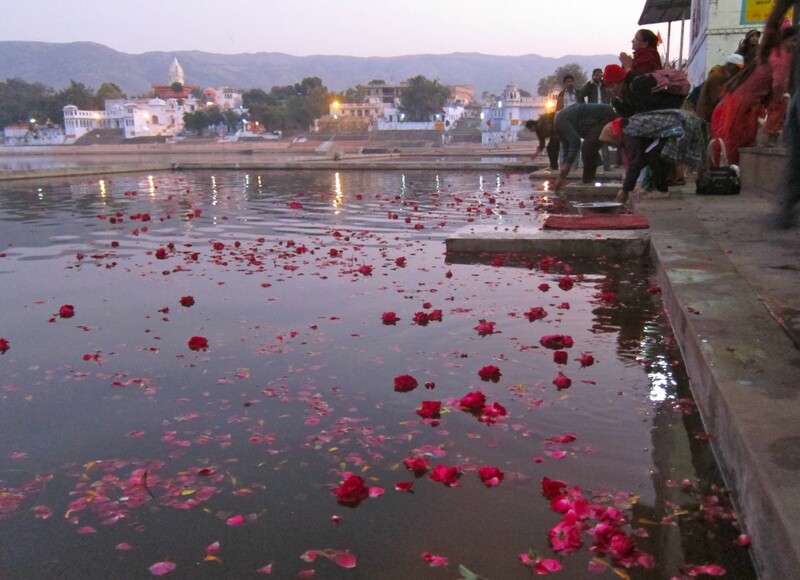 It is one of the oldest cities in India and one of the five sacred dhams (pilgrimage sites) for Hindus, visiting Pushkar to worship Lord Brahma. I found at least 4 different legends associated with the city’s initiation, but the main one is based on the Hindu scripture Padma Purana. According to it, Brahma saw the demon Vajranabha (Vajranash, in other versions) trying to kill Brahma’s children, so he immediately slew the demon with his weapon – the lotus flower. Lotus’ petals fell on the ground and created 3 lakes. When Brahma came down to the earth, he name the place Pushkar – “pushpa” for “flower” and “kar” for “fell from Brahma’s hand”. 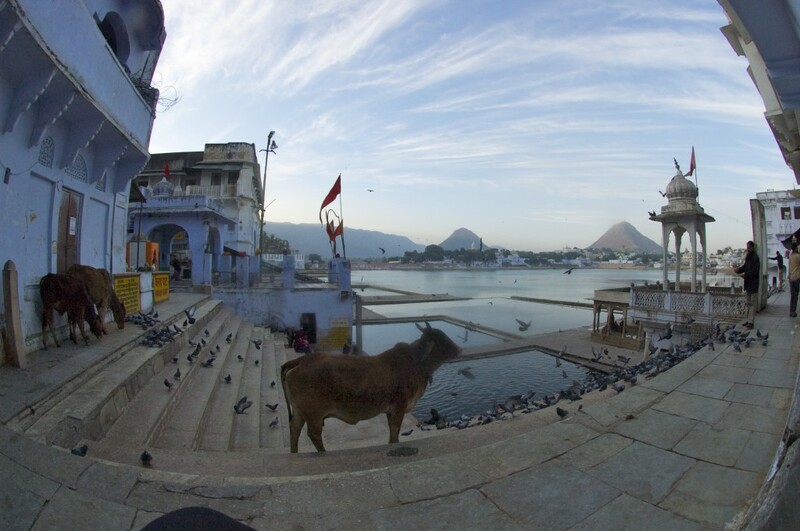 Brahma then decided to perform a yajna (fire-sacrifice) at the main Pushkar Lake. To perform it peacefully without being attacked by the demons, he created four hills around the Pushkar and positioned gods there for protection. However, to execute the yajna, he needed the presence of his wife Savitri (Sarasvati in some versions) who was away, waiting for her companion goddesses Lakshmi, Parvati and Indrani. Annoyed, Brahma request God Indra (King of Heaven) to find a suitable girl for him to wed in order to compete the ceremony. Indra could only find a simple Gujar’s daughter who was sanctified by passing through the body of cow. Gods Vishnu, Shiva and the priest certified her purity and named her Gayatri. Brahma married Gayatri and completed the yajna with his new consort sitting beside him, holding the pot of amrita (elixir of life) on her head and giving ahuti (offering to the sacrificial fire). When Savitri finally arrived, she found Gayatri sitting next to Brahma. Upset, she cursed Brahma that he would never be venerated, but then reduced the curse permitting his worship only in Pushkar. Savitri also cursed Indra – to be easily defeated in battles, Vishnu – to suffer the separation from his wife as a human, the fire-god Agni ,who was offered the yajna, – to be all-devouring and the priests officiating the yajna – to be poor. Endowed by the powers of yajna, Gayatri diluted Savitri’s curse, blessing Pushkar to be the place of pilgrimages, Indra would always retain his heaven, Vishnu would be born as the human Rama and finally unite with his consort and the priests would become scholars and be venerated. 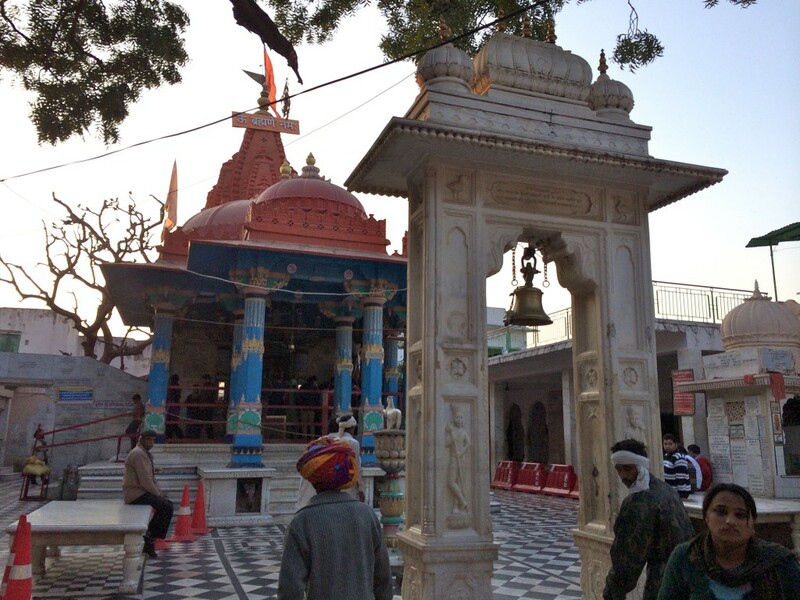 Thus, Pushkar (and Jagatpita Brahma Mandir in particular) is regarded the only place dedicated to Lord Brahma. Savitri moved into the Ratnagiri hill and became a part of it by emerging as a spring known as the Savitri Jharna; a temple in her honor was also established here. Sunil dropped me outside the city center as this place was so small, that only few local cars were allowed to enter. I dragged my suitcase for about 5 blocks to reach Hotel Kanhaia Haveli, located about a block away from the main Bazaar street. After checking in and upgrading my room (extra Rs.750), I inquired the owner of the hotel about the places I must visit and how long it would take. He said that the entire place, including 52 ghats and 500 temples would take no longer than 30 minutes to see!!! Apparently, no temples but Jagatpita Brahma Mandir are open for tourists, however, I didn’t verified this information, since it was already 5 pm and I hurried to see the famous Brahma Temple. The Temple was located on the other side of Bazaar, which is a long touristy street selling everything you need and don’t. The one things that caught my eye immediately was the serenity and hassle-free attitude. Perhaps, it was one of the few places in India where people didn’t stop to look at me, take photos or try to sell me anything I didn’t want. Everyone plainly went along with their lives – vendors, cows, tourist, pilgrims and a huge colony of hippies inhabiting the banks of Pushkar lake. I reached Jagatpita Brahma Mandir at around 5.30 pm, deposited my shoes and cameras at the store next door (Rs.50) and climbed the stairs to the Temple. As I mentioned earlier, Savitri’s curse banned worship of Brahma anywhere else, except for Pushkar, however, Jagatpita Brahma isn’t the only Brahman temple in the world, but definitely the most prominent one. Its current structure dates to the 14th century, though the temple is believed to be over 2000 years old. The original temple is said to be built by sage Vishwamitra after Brahma performed his yajna on the spot chosen by Brahma himself. The 8th century Hindu philosopher Adi Shankara renovated the temple, while the present medieval structure dates to Maharaja Jawat Raj of Ratlam, who made additional constructions and repairs preserving the original design of the temple. Since then, Brahma Mandir was restored a few times, especially after it was destroyed and desecrated during the rule of Aurangzeb (1658-1707). The Temple is located on high plinth which requires a steep climb up the marble steps via entrance gate archway decorated with pillared canopies. 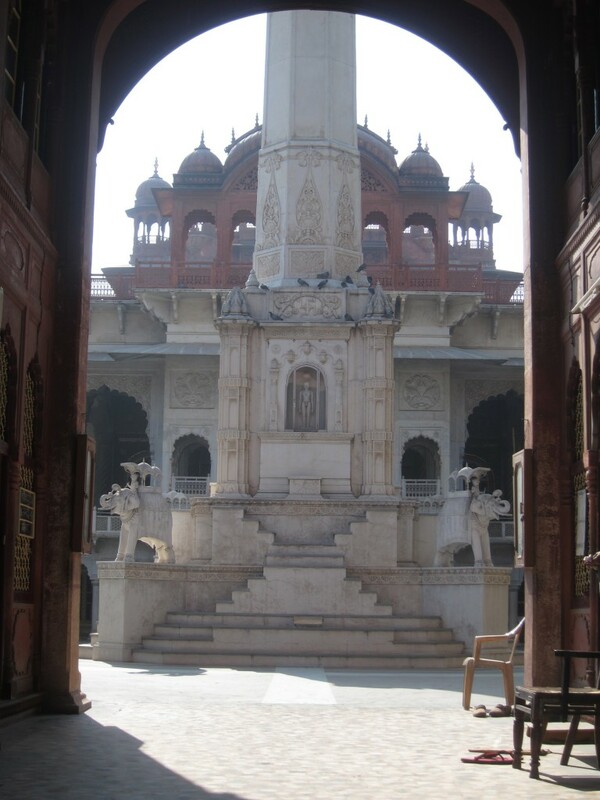 The gate entry leads to an outdoor courtyard and then to the sanctum sanctorum – Garbhagriha. The temple is built of stone slabs and blocks, with a red spire symbolizing a goose (a mount of Brahma), decorating the temple. Marble, black-and-white checked floors and walls are inlaid with hundreds of inscribed silver coins donated by devotees. Brahma’s central icon is made of marble and was deified in the Garbhagriha in 718 A.D. by Adi Shankara. The icon depicts Brahma as chaumurti – a four-faced idol with four hands, four faces each oriented in a cardinal direction. Brahma sits on top of hamsa (a goose) and holds in his hands four symbols – rosary, a book, kusha grass and a water pot. His new wife, Gayatri is seated to his left and Savatri, along with other deities of the Hindu pantheon, to his right. I spent about 20 minutes at temple’s courtyard, snapping photos with an iPhone (which was allowed) and distributing my wealth to the beggars. After picking up my belongings, I hurried to make a pilgrimage to the famous ghats of Pushkar Lake. It is a holy place and according rules apply -take off and deposit your shoes before entering the ghats; if you plan to bathe yourself in the lake, do it with dignity; don’t take photos of the people or the ceremonies; don’t joke around. By the time I reached Varah Ghat, evening aarti was in full preparation. The local worshipers invited me to join them for this intimate and authentic (unlike an aarti in Varanasi) ceremony. It went on for about 15 minutes at the end of which everybody threw their flowers into the water. Seeing that I had no flowers, many people came and share theirs with me. It was a truly dignifying Hindu experience. After the aarti, I headed back to the hotel where I had a simple dinner at the roof-top restaurant. It was freezing and only one other Italian couple was there having dinner, along with, what it seemed like, a local guide aka drug dealer. We chatted and their “guide” after eliminating me from his list of potential clients, offered me an authentic Pushkar Malpua. After securing a few extra blankets and a space heater (Rs.200), I was finally able to fall asleep. I woke up early morning to walk through the ghats again and take pictures of them without disturbing anybody. Even though, the streets of Pushkar were empty, ghats were buzzing with local people. I spent 30 minutes in tranquility, watching the morning rituals and stray puppies playing on the bank of the lake. After less than 18 hours in Pushkar, I could understand why many people find this place attractive and option to stay here for weeks and months at the time. In my case, I was rushing to another rarely visited place – Chittorgarh Fort. This entry was posted in Asia and tagged aarti, Adi Shankara, Agni, Agra, ahuti, Ajameru Doorg, Ajayraj Singh Chauhan, Ajmer, Ajmer Jain Temple, Akbar, amrita, Ana Sagar Lake, Aurangzeb, bazaar, Brahma, Brahma Temple, British Raj, Bukhara, chador, Chauhan, chaumurti, Chechi Gurjar, Chishti, Chittorgarh, Chittorgarh fort, cour des miracles, curse, Dargah of Khwaja Muin-ud-din Chishti, Dargah Sharif, deg, devrish, dhams, Digambara, fire-sacrifice, garbhagriha, Gayatri, hajj, Hazrat Meeran Sayd Hussein Dargah, Hazrat Syed Meeran Hussain, hijda, hijra, Hindu, Hinduism, Hotel Kanhaia Haveli, Humayun, India, Indra, Indrani, Islam, Jagatpita Brahma Mandir, Jahangir, Jainism, Jaipur, Jinasena, Khwaja Moin-ud-din Chishti, Kos Minar, Lakshmi, Lord Rishabhdev, Magazine, malpua, manastambha, Maratha, Marwar, Mecca, Medina, Mewar, Mughal, Muhammad, Muhammad of Ghor, Muslim, Namaz-e-Janaza, Nazrat Khwaja Usman Haruni, Nizam of Hyderabad, Nizamuddin Auliya, Padma Purana, panch-kalyanak, Parvati, pilgrimage, pir, Prophet, Pushkar, Pushkar lake, Pushkar malpua, Qutb-ud-din Aibak, Qutb-ud-din Jhonpra, Rajasthan, Rajput, Ratnagiri hill, Rishabha, Salat al-Janazah, samavasarana, Sarasvati, Savitri, Seth Moolchand Soni, Shachi, Shah Jahan, Shaikh Ibrahim Kunduzi, Shiva, shrine, Siddhkoot Chaityalaya, Soni, Soniji Ki Nasiyan, Sufism, Sulh-e-Kul, Svarna Nagri Hall, Taragarh Fort, Taragarh HIll, temple, thakur, Tirthankara, Usman Harooni, Varah Ghat, Vishnu, Vishvamitra, yajna. Bookmark the permalink.